Maybe I’m just an optimist, but I think people today mostly acknowledge the importance and originality of philosophy in the Islamic world. Would any scholar now say in print, as Bertrand Russell notoriously did in his History of Western Philosophy (written in 1945), that ‘Arabic philosophy is not important as original thought. Men like Avicenna and Averroes are essentially commentators’? I certainly hope not. But even if we now see more clearly, we still have blindspots. The thinkers taken seriously as ‘philosophers’ are typically the authors Russell dismissed as mere commentators, men such as al-Kindī, al-Fārābī, Avicenna, and Averroes. Though they were far from unoriginal, they were indeed enthusiasts for Aristotle and other Greek authors. Yet these were not the only intellectuals and rationalists of their time, nor did rationalism and philosophical reflection die with Averroes at the end of the 12th century, as is still often believed. 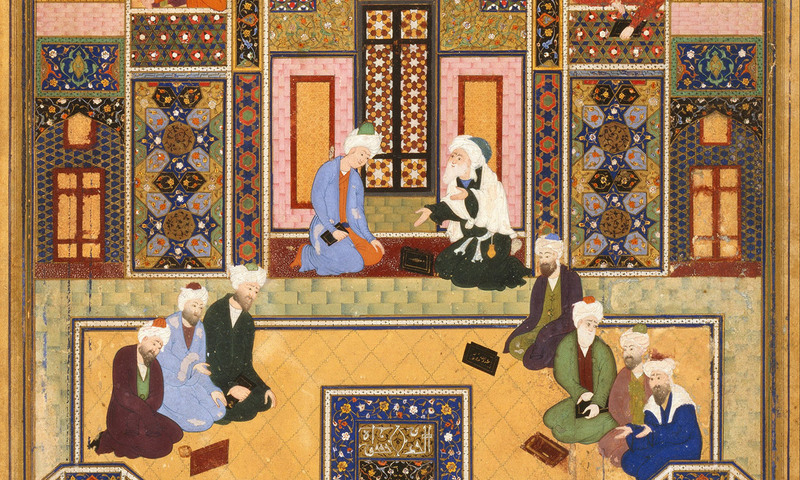 Throughout Islamic history, many of the figures of interest and relevance to the historian of philosophy were not Aristotelians, but practitioners of kalām, which is usually translated as ‘theology’. The word kalām literally means ‘word’, and here abbreviates the Arabic expression ʿilm al-kalām: ‘science of the word’. It is often contrasted to the term falsafa, which as you can probably guess was imported into Arabic as a loan-word from the Greek philosophia. When modern-day scholars draw this contrast, when they assume that kalām was non-philosophical or even anti-philosophical, they are taking their lead from the medieval tradition itself. In particular, from two self-styled ‘philosophers (falāsifa)’, al-Fārābī and Averroes. In their eyes, the ‘theologians (mutakallimūn)’ engaged in mere dialectical argumentation; whereas philosophy offers demonstrative proofs. The theologian does not ground arguments in first principles, but just defends his own favourite interpretation of scripture against rival interpretations. Averroes was scornful of the results, complaining that it can lead to violent schism. For him, only a philosopher can offer a really reliable reading of the Quran, since the philosopher knows what is true on independent grounds – that is, on the grounds of Aristotelian science. But should we accept this sharp opposition? These Aristotelians talk as if kalām makes insufficient use of reason. But most contemporaries would have seen it as controversial precisely because it was so rationalist. Theologians often departed from the surface meaning of the Quran on rational grounds: Revelation might seem to speak of God as if He had a body, but we can rule this out by giving arguments against His corporeality. The mutakallimūn also engaged in detailed disputes over such central philosophical issues as free will, atomism and the sources of moral responsibility, and debated such technicalities as the inherence of properties in substances, or the status of non-existing objects. If history had gone differently and there had been no hard-line Aristotelians writing in Arabic, I have no doubt that historians of philosophy would consider the output of the mutakallimūn to be the ‘philosophical’ tradition of the Islamic world. That would have made our approach to Islamic intellectual history more like our treatment of Christian medieval thought. After all, medieval philosophy classes are mostly devoted to figures who considered themselves to be ‘theologians’, such as Anselm, Aquinas, Duns Scotus, and William of Ockham. Of course, there are plenty of people who don’t like medieval philosophy either, precisely because of its religious context. But my view is that philosophy is where you find it, and that it is narrow-minded to ignore philosophical argumentation put forward by thinkers simply because they have a religious agenda, whether that agenda grows out of Christianity (as with Aquinas), Judaism (as with Maimonides), Hinduism (as with Nyāya epistemology or Vedānta philosophy of mind), or Islam. The refusal to appreciate the philosophical interest of kalām is especially pernicious when it comes to the period after the pivotal figure of philosophy in the Islamic world, Avicenna (he died in 1037). His impact was enormous and pervasive. So we find ‘theologians’ such as al-Ghazālī (died 1111) and Fakhr al-Dīn al-Rāzī (died 1210) engaging in minute analysis of Avicenna’s arguments, accepting some aspects of the Avicennian system while finding fault with others. Al-Ghazālī is notorious for his critique of Avicenna’s metaphysics in The Incoherence of the Philosophers, but he also heaped ridicule on anyone who denied the utility of the philosophers’ logic. As for al-Rāzī, his enormous theological compendia are comparable to those written by men such as Aquinas and Scotus in Latin Christendom, filled with scholastic argumentation and even structured in terms of philosophical elements like the Aristotelian categories. The myth that philosophy somehow died out in the Islamic world around the time of Averroes (died 1198) is in part the result of assuming that such texts fall outside the remit of the history of philosophy, despite being chock-full of intricate philosophical argumentation. All of which is not to deny that some other kalām texts would be of limited interest to the philosophically minded reader, or that the mutakallimūn did typically proceed on the basis of scriptural exegesis instead of (or in addition to) pure rational argument. Nor is this the only reason that kalām texts can frequently be frustrating to the philosopher. Al-Fārābī and Averroes were right that there was a ‘dialectical’ tendency in their theological contemporaries. Premises might go unexamined because an envisaged opponent is bound to accept them, and there is a tendency – in early kalām especially – to answer questions with verbal formulae that all parties might accept, rather than delving deeper to find a really satisfying answer. But that tendency is reduced to some extent in later kalām literature. In fact, my impression – which I offer tentatively, given the vast amount of later kalām literature that is as yet unedited, and unstudied – is that kalām becomes significantly more ‘philosophical’ as the tradition developed. In the post-Avicennan period, the situation was increasingly like what we find in late 13th-century France: the most interesting and sophisticated philosophers were the theologians. It might seem greedy of me to ask that a wide readership come to appreciate kalām, when most self-described ‘philosophers’ in the Islamic world are still rarely studied by non-specialists. It’s not as if undergraduate students are already routinely asked to read Avicenna and Averroes, never mind their ‘theological’ contemporaries and heirs. But even if the relevant texts remain largely unstudied, it is worth spreading the news that rationalism in Islam did not die with Averroes, and that the famous partisans of philosophy in the Islamic world, like al-Fārābī, Averroes and Avicenna, had no monopoly on philosophical thinking there.